**Compelling contemporary avant-garde collaboration between Poland's living-legend Krzysztof Penderecki and Radiohead's revered and innovative guitarist/composer** "Nonesuch Records releases an album of works by Polish composer Krzysztof Penderecki and composer/Radiohead guitarist Jonny Greenwood. The artists' work was presented side-by-side in two concerts in September 2011, highlighting Penderecki's influence on younger composers, at the European Congress of Culture in Wrocław. In its report on the Congress, which celebrated Poland's presidency of the European Union, London's Independent called Penderecki "Poland's godfather of the musical avant-garde" and Greenwood "the doyen of English art-pop," describing their concert as "rapturously received." The composers went to Kraków's Alvernia Studios immediately after the performances to oversee the recording of the same music, along with one other piece by Greenwood. 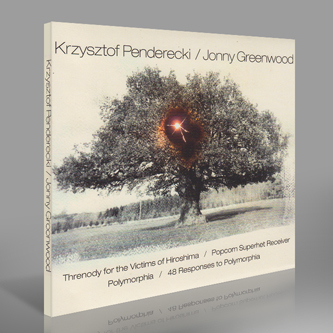 The Wrocław concert included two works by Penderecki dating from the early 1960s: Threnody for the Victims of Hiroshima and Polymorphia (for 48 strings), the latter of which inspired the Greenwood piece on the program, 48 Responses to Polymorphia; all three are on the Nonesuch record. An additional piece by Greenwood, Popcorn Superhet Receiver, which was inspired by Penderecki's Threnody, also was recorded for the album. (Greenwood incorporated material from Popcorn Superhet Receiver in his award-winning score for the 2008 film There Will Be Blood, which was also released on Nonesuch.) For both the concerts and the recording, the pieces were performed by the AUKSO ensemble, which comprises graduates of Poland's Katowice Academy of Music. Penderecki conducted the ensemble in his works and AUKSO's artistic director-the violinist, chamber musician, and conductor Marek Moś-led the group for Greenwood's pieces. The record was produced by Filip Berkowicz-artistic director of the Sacrum Profanum, Misteria Paschalia, and Opera Rara festivals and curator of the Penderecki concerts in Wrocław-and made in association with the National Audiovisual Institute of Poland."